Numerous dysfunctional behaviours can present themselves at mealtimes. Among these, a particularly relevant problem in those with Autism Spectrum Disorder appears to be food selectivity, which is one of the most disabling problems due to the possible consequences on the nutritional and relational level. The main objective of the volume “Food Selectivity in the Autism Spectrum Disorder” is to clarify the concept of food selectivity, providing an updated and detailed overview of the problem and investigating the factors contributing to food selectivity in people with autism. In this regard, sensory alterations, cognitive rigidity, the role of gastrointestinal symptoms and the consequences of food selectivity (nutritional aspects, obesity, family functioning) are investigated. The diagnostic tools necessary for evaluation and intervention are then presented, underlining the crucial role played by parent training and parent support programs. Tools that, within the treatment, are fundamental for the management of the problem. 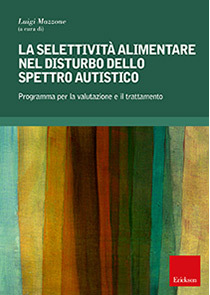 This volume, the first in Italy to present a detailed analysis of the food selectivity problem in people with Autism Spectrum Disorder, is intended to be a support handbook for parents and a first treatment guide for therapists and for all those experienced professionals of nutrition specialize in the treatment and food rehabilitation of people within the autism spectrum.